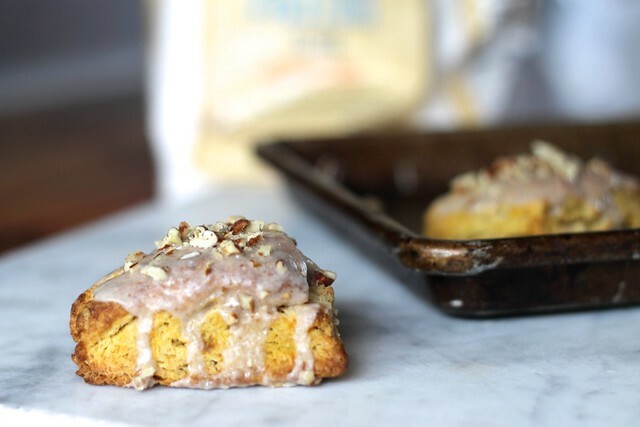 At the end of this post is yet ANOTHER recipe for pumpkin scones. I don't think the world needs another one, but Saturday morning begged for them--I had a tub of roasted squash (a mix of acorn, butternut, and pumpkin) in the fridge that needed to be used up. So really, squash scones. I brought some over to our neighbors Jim and Marjia who were working in their yard. My favorite thing about Jim is that he doesn't act disinterested. Not one little bit. He grabbed a scone with his gardening hands and ate it right there in the yard. Nothing could make me happier. And Marjia scolded him for taking the biggest one. We've had a bout of sickness around here this week--Loretta's the worst, but I'm sick, too, Wyatt's fighting something, and we've been blasting through the tissue, iburprofen, cough syrup, and honey lemon tea. But there have been so many moments of connection in the midst of it--more proof that what I really want and need is mutual dependence--there's no such thing as relationship without it. A few weeks ago, I admitted to some friends and acquaintances that I was feeling lonely. I didn't enjoy that admission. In the age of Facebook and Instagram, the whole point is to at least appear completely booked and preoccupied . I did this, I did that, so-and-so and I really connected over some amazing meal or moment. To come out and say you're lonely? Not really in vogue. But here's what happens when you do: poeple respond! And the discipline is just to take it in, to say "thank you," to let yourself soak up the love that you didn't know you needed so badly. As Rumi says, the need brings in what's needed. Walking on the trail with Margie, my friend from church, who's 20 years older than me and has lived beyond this stage of life, and her putting her arm around me and not saying anything. Holy moment. Having bouts of insomnia and knowing, in the middle of the night, with the Northwest winds raging, that God is alive and doing her thing. Podcasts! So much amazing storytelling that lifts me beyond myself. This American Life, OnBeing, Serial, Radio Diaries. The world is full of people who have survived incredible things. Tracy bringing over chicken noodle soup and Loretta eating 4 bowls of it when nothing has sounded good to her all week. Breeze bringing over cough syrup, elderberry syrup, banana bread, flowers. Some people are born with an extra dose of Thoughtfulness, and she is one of them. Elizabeth doing double duty on carpooling so I can stay home and nurse Loretta. My meditation corner. It's really filling up with talismans now. Finger labyrinth, candles, Mary Oliver's and Christian Wiman's new poems, my favorite box of matches. God is everywhere, of course, but I posiiton myself to catch those beams of love in that 5 square feet. Every healthcare worker who has put him or herself in danger to help Ebola victims. They put me to shame, inspire me, and expose the love that pulses behind everything. What are your little miracles lately? As always, being here with you takes the edge off the loneliness. We are all on this road together. Yep, I googled it. Knowing which recipes are good and which aren't so good is a skill, and I wish I could explain it better. It's saved me a lot of heartache. Where scones or lots of baked goods are concerned, be wary if there's not enough fat in the recipe. Or if lots of waiting and steps are involved. Scones shouldn't be that way. And I LIKED that there was corn syrup in this glaze, which meant that it would harden up and be shiny just like I wanted it to be. 2 Tablespoons of corn syrup isn't going to hurt you any more than sugar will--it acts the same way in your body. And if you buy a bottle, you can make caramel corn at Christmas! The only change I made to this recipe was using fresh roasted squash instead of canned pumpkin, and I used more like 3/4 c. because I wanted more moisture and pumpkin flavor. And I used toasted pecans instead of walnuts. You could leave the nuts out alltogether if you want. I woke up this morning feeling content. Sometimes my anxieties come flooding in before my feet hit the floor. On good mornings, I don't let myself get out of bed until I've formed some intentions for the day--to be grateful and mindful, to be kind to the children, friends, or clients in my sphere. And today, one of my intentions was to bake. I found this recipe on Foodgawker. Foodgakwer is a (favorite) juried site where food bloggers can submit photos. (You can find In Praise of Leftovers gallery here.) I like searching for recipes on it because 1) All the thumbnail photos pop up and I can compare recipes 2) I'm exposed to great food blogs I didn't know about and 3) Going to the site is always a visual treat. I chose these for the crunchy topping. The kids downed two apiece and I took the rest to church. My friend Dawn was sitting across the table eating one and praised them. She said, "Wow, you just lit up! Nothing makes you happier than cooking for people." And she's right. 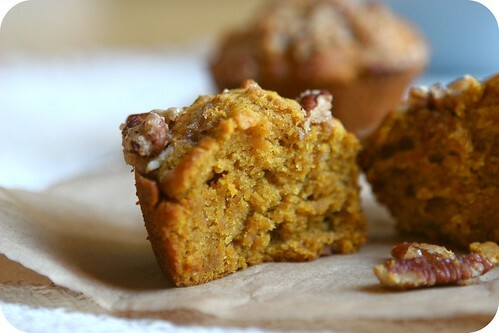 These are just what I want in a pumpkin muffin--heavy on the pumpkin, moist, sweet, and a crunchy streusel that elevates them above your average version. Makes 18. Adapted from Once Upon a Chef . You can leave off the topping, but I think they'd be much less interesting. If you don't want nuts, you can sub old-fashioned oats for the nuts and still get a nice streusel. Preheat oven to 350 degrees. Grease two standard muffin pans. For Topping: Combine flour, butter, demerara sugar, chopped pecans and cinnamon in a small bowl. Set aside. For Muffins: Combine flour, salt, baking powder, baking soda, cloves, cinnamon and nutmeg in a medium bowl and mix well. Set aside. In the bowl of an electric mixer, beat butter and sugars at low speed until just blended. Add eggs one at a time, beating well after each addition; continue beating at medium speed until very light and fluffy, a few minutes. 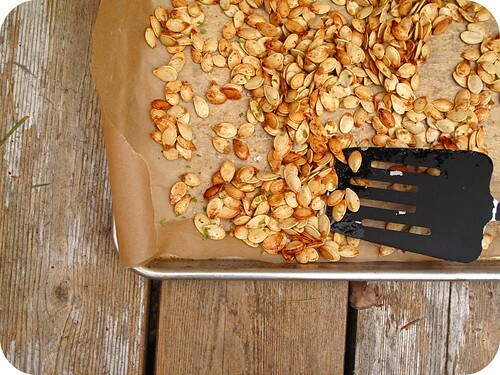 Add pumpkin and beat until combined, scraping down sides of bowl as necessary. Turn speed down to low and mix in flour mixture until just combined. Use an ice cream scoop to transfer batter to muffin pans, filling each muffin tin about ¾ full. Sprinkle topping evenly over batter. Bake for about 30 minutes. Let cool on rack for about 10 minutes, then turn out onto rack to cool completely (use a butter knife to lift them out of pan).